check out the guitar a friend of mine just gave to me! it’s one ugly bass guitar but for some reason i’m strangely excited about it. it seems to be in good shape too. one knob is loose. the tuners are good. the bridge seems okay. i don’t have strings for it yet so i can’t plug it in and check out how it sounds or even really know if the pickups are in working order but i’ll string it up tomorrow and cross my fingers that it’s a diamond in the rough where sound is concerned. here’s something i’ve never seen before. it’s got two jack outputs! one labeled “standard” and the other “stereo-sound”. WTF??? now i’ve had bass guitars before but none with double jack outputs. i just wish it had some kind of serial number so i could research it online. well… it sure ain’t as pretty as my gretsch, but i think i’ll be very happy to hold onto it. seems this ugly duckling is beginning to grow on me! 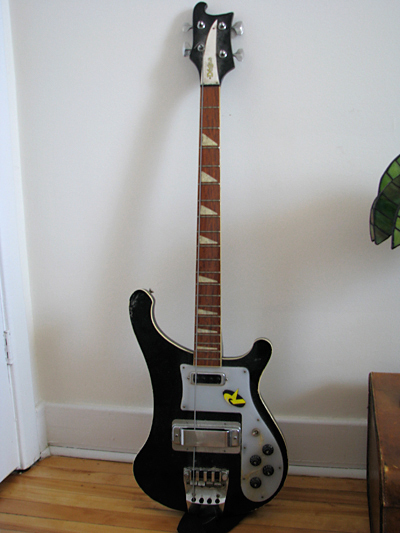 UPDATE: it’s an el degas model 4001 rickenbacker copy. not sure exactly what year. mid to late 70s early 80s i think.